Beeston In Bloom have teamed up with St Mary’s Church in Beeston to hold a Christmas Tree Festival in the church. Local community groups, including the Scouts, Cockburn John Charles Academy, Shine and Friends of Stank Hall Barn have been invited to provide and decorate a tree to portray their activities. 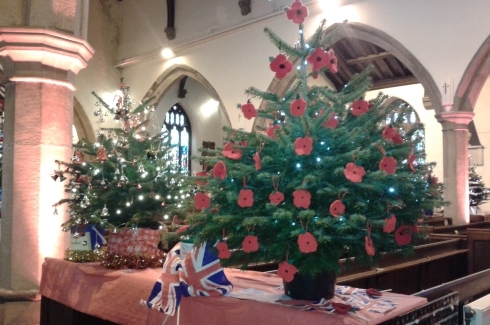 The trees will be displayed in the side aisles of the church in the week beginning 10th December. The “All Things Craft” Group which is based at The Beeston Skills Hub is creating a Tree which will be to dedicated to those who are sadly no longer with us. The tree will feature small photographs of the people with their name. So if you would like a dedication to some who is now not with us, please send a good quality jpg image, before Saturday 1 December, to steve@thompsonleeds.co.uk who will arrange a place for it on the tree. Once the festival starts, there will be an opportunity for additional photographs to be displayed, however they must be 2 inch x 2 inch. There will also be an opportunity to donate something to The Yorkshire Cancer Centre to help them in their fantastic work right here in Leeds at St James Hospital. Due to the tree design there are limited photo spaces, so please get in touch as soon as possible. If you would like to chat to Steve please feel free to call him on 07754 391490. St Andrew’s Methodist Church on Old Lane hold a similar event every other year and the two churches have agreed to alternate so that Beeston will have a festival every year.